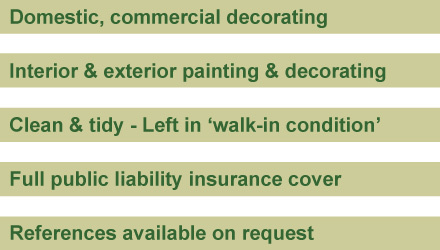 Owner Kevin has been specialising in the painting and decorating trade for over 29 years. Kevin and his team are experts in domestic and commercial decorating, undertaking numerous projects of great variety including wallpaper hanging and single room decorating in the domestic sector to a full decorating service for a Glasgow commercial premises. Kevin Owens Decorators are based in Coatbridge and cover a wide surrounding area including, Coatbridge, Airdire, Uddingston, Bothwell, Bellshill, East Kilbride and Glasgow. All Kevin's work is carried out to the highest professional standard, guaranteed and all work is quality assured as well as being competitively priced. Kevin is personally on every job which means a quality finish everytime. Kevin offers free written quotations and references are available upon request.